For 16 years running, Davler Media Group’s Metrosource, the largest circulation LGBTQ publication serving New York City and Los Angeles, and second largest nationally, has ended each year with People We Love. In the December/January issue, and on metrosource.com, People We Love honors the people and organizations who display extraordinary acts of service and philanthropy, raise awareness about LGBTQ rights and culture and model excellence in being part of the LGBTQ community. 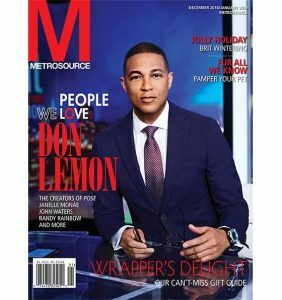 The cover story subject of 2018’s People We Love is veteran CNN anchor Don Lemon, an openly gay journalist who has demonstrated exceptional courage in President Trump’s ongoing battles with his network and the media at large. Lemon is in the unique position of being a direct target of both the President’s barbed tweets and, in October as he was being interviewed by the magazine, of Florida terrorist Cesar Sayoc. Metrosource’s interview with Lemon goes beyond politics, delving into his youth in Louisiana, his coping with abuse during these years and his current happiness off-camera with his partner, real estate agent Tim Malone. The other honorees featured in People We Love 2018 include filmmaker John Waters, musician and actress Janelle Monáe, actress Samira Wiley of Orange is the New Black and The Handmaid’s Tale, veteran British actor Rupert Everett, columnist Michael Musto, comedians Cameron Esposito and Hannah Gadsby and new media figures like YouTube satirist Randy Rainbow and blogger Kenneth Walsh. Also spotlighted are impactful community leaders and organizations including Leo Preziosi, founder of the student advocacy organization Live Out Loud, LGBTQ legal advocacy organization Lambda Legal, LGBTQ scholarship organization The Point Foundation, and SAGE, an organization providing support to the elder LGBTQ community. Metrosource’s People We Love also cast a spotlight on Olympian and Dancing with the Stars winner Adam Rippon, President & CEO of NYC & Company Fred Dixon, the entire cast and creative team of the FX series Pose, NYC Promoter Brandon Voss, and Doctor Evan Goldstein. The final honoree will be determined by the public, which can head to https://metrosource.com/legendaryqueens to cast a vote for their favorite New York City Drag Queen. The legends nominated include Sherry Vine, Hedda Lettuce, Lypsinka, Shequida, Tina Burner, Lady Bunny and Joey Arias. All who cast a vote will be entered to win a pair of VIP tickets to the People We Love gala on January 15, 2019. Metrosource is complementing its editorial with a gala event saluting the honorees, January 15, 2019 at 48 Lounge in New York City. The program is being co-sponsored by Red Bull, Go Israel, Health Sherpa and Entertainment Cruises. The 10-page special section in the December/January issue will be complemented with more in-depth profiles that will roll out weekly on at the magazine’s website, metrosource.com/peoplewelove.